There are several ways in which you can perform this operation. We will be focusing on the Launcher app method if your phone does not support it. It is obvious that the default font for all almost all android phone is Roboto. It looks pleasant and is usually of the right size for comfort. 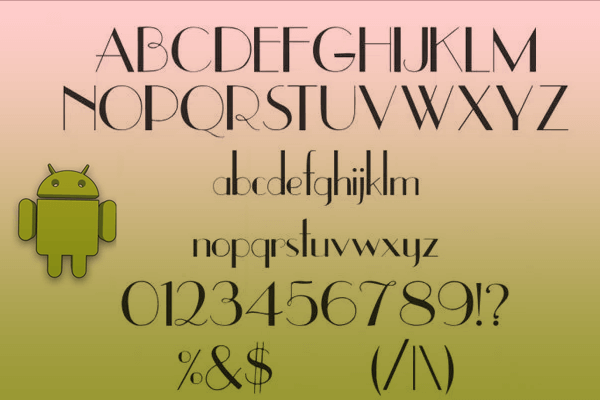 But, there will always be Android users who’d prefer some other typeface; those who’d want to stand out from the crowd. And there will always be that small crowd of people who tinker with their Android device’s fonts just for the sheer pleasure of being able to. If you belong to either or both groups, you’re on the right page. The great thing about Android is that it is an extremely customizable mobile operating system; it even allows you to change the fonts used by its user interface. Font changing, however, doesn’t necessarily mean easy. In many cases, customizing fonts requires some technical know-how. In this guide, learn how to change fonts on Android. Two types of methods are discussed: one not needing root, and the other requiring root. Some phones already have it built in! While stock Android lacks the ability to customize your system font, plenty of manufacturers have adapted their software to support this highly requested feature, allowing you to easily change fonts for Android. These include important companies like Samsung, HTC and LG. The process may change depending on your specific handset, but you can always find this option in the settings. It’s usually under the Display section. From there you can change the actual font, as well as the font size. For instance, some Samsung Android devices let you change the font style. Samsung has pre-installed a few extra fonts besides the default, but you can get more online through the Google Play Store. If your phone does not support the idea of changing fonts of your device, you can follow the steps below with the aid if an app to do it yourself. Using Go Launcher: Putting on a new font requires only a quick trip to Settings > Display > Font Style. Just tap the name of the font that you want, and confirm that you want to set it as system font. Font replacement is instantaneous. No need for rebooting. The selected font will be displayed throughout your device’s interface such as the time on the status bar, system menus, and even on your text messages. Is your manufacturer not opening the doors you need opened? Don’t you worry. One non-root way to change fonts for Android is through custom launcher apps. Some custom launchers integrate the font-changing function, while most others will need you to install themes. Copy your TTF font files to your phone. Start GO Launcher and open the tools app, click on the Preferences icon. Scroll down to Personalization and select it. Click on Font. Click Select Font and tap on the font that you want to use. Changes will apply immediately. No need for rebooting. If you want more fonts for use with GO Launcher EX, download and install GO Launcher Fonts. The iFont app can also be used to change the fonts on Android. The only issue was that it used to be a bit limited and used to work only with Samsung devices. Easy to operate eliminate the tedious steps. Change font size, make size from small to big. Launch iFont. press the Online tab. Tap on a font name that you want to install. Tap the Set button. Or go to Settings > Display > Font Style. Your newly installed font should appear on the list. Tap on the new font to use it as system font. Font will be applied immediately. iFont is free and shows no ads. It worked quite well on several devices (including non-Samsung phones) that I tested it on. XOS Launcher (Theme & Wallpaper) is Infinix official launcher for your Android phone, and you can customize this launcher the way you want it to be: apply your favorite themes, wallpapers, organize your apps in folders automatically. – This Launcher makes it easy to find your favorite apps, the more you use it, the better it gets, and XOS Launcher will knows you better than you know yourself. – More than 2 million users around the world are using this top rank launcher. – Auto-group related apps using Smart Arrange feature to keep your screen organized. When you download the app it is easy to use, you will see the X theme in the application menu, when launched you will see an option to select and change the current font. Summary: If one Launcher does not work as expected you can try another ones apart form the listed ones above. Simply head over to Google Play Store to get the appropriate app.